The financial ratios are primarily tools for turning the date enclosed in financial statements into information used by managers and executives to better comprehend what is happening in a company. Financial ratios are highly advantageous indicators of an organisation’s performance as well as financial environment. Financial ratios are typically used in the process of analysing trends and also comparing the organization’s financial position to other firms. In few instances, an effective analysis conducted by financial ratios can help to predict the forthcoming bankruptcy or economic failure. Financial ratios can typically be grouped according to the data they make available. Profitability ratios specify the profit earning capacity of a company. The profitability ratios are fundamentally used to evaluate how effective an organisation has been in accomplishing its overall profit targets, specifically in relation to the Resources invested. Several measures of profitability relate an organisation’s earnings to its sales, assets or equity. 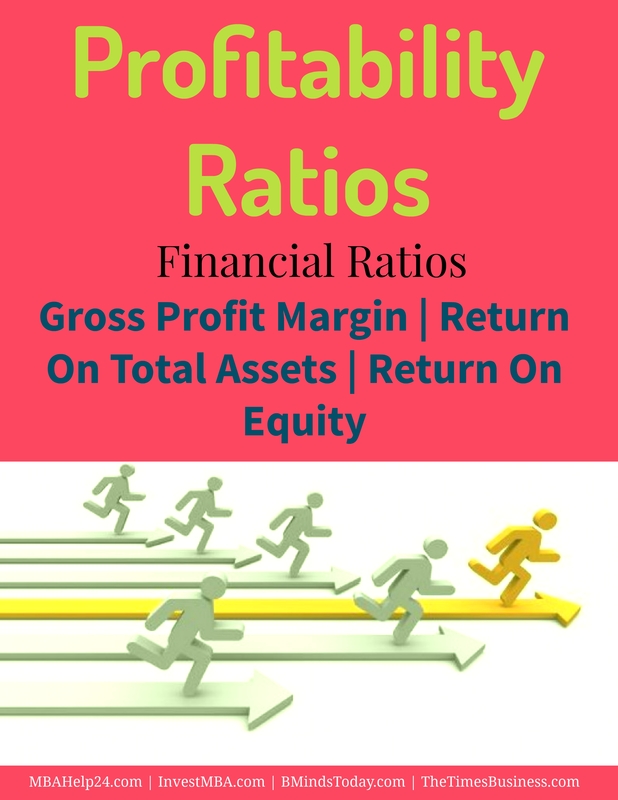 Profitability ratios are among the most closely observed and extensively cited financial ratios. Profitability ratios propose a number of diverse measures of the success of the organisation at generating profits. The gross profit margin is a measure of the gross profit made on sales. The gross profit margin considers the organisations’ cost of goods sold, nonetheless does not consist of other costs. It is always a strong indication for the company to have maximum gross profit margin. The gross profit should be sufficient to cover the operating expenses and to afford for fixed expenses, dividends and building up of reserves. The return of on total assets, prevalently called the return on investment (ROI), measures the overall effectiveness of organisation in using its assets to produce returns or profits. The sum of net income received in relation to total assets specifies how competently an organisation uses its financial Resources. When a comparison is made of the return on total assets of one organisation to another organisation, the time period of the assets of each company should be considered. Specifically, the return on a firm’s assets will grow higher as the assets become older because the denominator will decrease each year as a result of the increase in accumulated depreciation. Return on equity is a closely related measure for the shareholders, which measures the profits earned for each dollar/euro/pound invested in the organisation’s stock. When the organisation makes a profit, even after making interest costs to creditors and giving dividends to a list of shareholders, the organisations’ use of leverage increases the return earned by average shareholder, and return on equity surpasses return on total assets. Considering the comprehensive perspective, the profitability ratios are fundamentally categorized into two types; general profitability ratios and overall profitability ratios. 1. The financial analysis cannot be a factual guide to organisation’s performance as it does not help the financial analyst drive deep into operational details. For example, if an organisation does not keep up a sound depreciation policy and announces huge profits, high profitability ratios would basically be deceptive. 2. The values of the current assets as well as amount produced change frequently which may create misrepresentations in Accounting measures of performance and financial situation. 3. The reliability of the standards against which the ratios are seen, is frequently uncertain. Except the norm is consistent, any implication drawn on the basis of ratios may be deceptive. Hence, those who deal with the ratios must supplement the financial ratio analysis with substitute implements in order to test its trustworthiness.